In 2013, Consumer Reports magazine surveyed 1,000 people about their doctors. The intention was to identify and rate the most common client complaints. Having recently come across the article, I felt compelled to examine a few of these concerns from a veterinarian’s point of view. If you find yourself nodding in agreement with any of these statements when you visit the veterinarian, it’s important that you bring them up. Remember, a stronger bond with your pet’s doctor will probably mean a healthier pet. How well you understand your veterinarian will likely depend on the individual communication style. Some family veterinarians and specialists are very good at using everyday words and simplifying things so you can understand. Others may need to be asked if they can simplify. What should you do? If you do not understand something, don’t be shy or embarrassed, and please ask questions until you get it. Your pet’s health is at stake here! Some veterinarians will call personally with test results, especially positive test results. Sometimes, when results are straight-forward or negative, they may ask a technician to call you. That said, please keep in mind that some tests take time to perform — sometimes up to a week if not two. What should you do? Ask when you should expect your test results and write the date on your calendar. If it is time and you have not heard from your veterinarian, simply call to inquire. This is hopefully less commonly an issue in veterinary medicine, because human medical billing (which is notoriously nebulous) goes not only through your doctor’s office but also your insurance company. That’s not to say pets shouldn’t have insurance too., but it tends to be less complicated. Click here to learn why ensuring your pet is so important. What should you do? You have the right to ask for a detailed estimate (before services are rendered) and a detailed invoice (after treatment has been provided). If you have a concern, have someone go over each item and voice your concerns. Some veterinary hospitals are clearly busier than others. Some are more able than others to cater to their clients and will fit in a sick patient no matter what. What should you do? Try not to let small issues become large problems or emergencies. If your pet is vomiting, call sooner for an appointment rather than letting a few days go by. 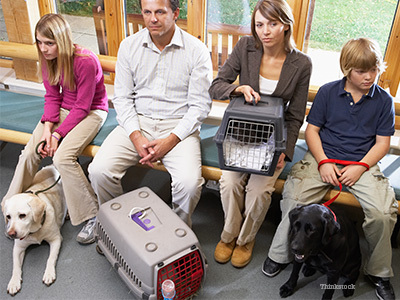 For true emergencies, know where your nearest veterinary emergency hospital is. Some clinics dedicate 5-10 minutes for appointments, while others may allow 20-30 minutes. Things are a bit different at an emergency hospital. If you are the only client, you shouldn’t feel rushed. But chances are, there are multiple other patients — some in critical situations — being seen or treated. In such cases, the doctor will logically have less time to dedicate to less critical patients. This is very similar to what happens at a human ER. What should you do? Prepare a list of the three most important questions you have, and make sure you at least get these answers. We are very fortunate in the veterinary world that insurance companies (or at least the good ones) do not dictate how we practice medicine. Overall, most veterinarians use good judgment before sending a patient home. What should you do? If you have concerns about the duration of your pet’s hospitalization (it’s too long or too short) you should have an open discussion with your veterinarian. Sometimes, the stay is shorter than we’d like due to financial or behavioral concerns. For example, an aggressive pet may not be able to be treated properly without endangering the staff (or himself). Or a pet may refuse to eat at the hospital. In such cases, an agreement should be reached with the guardian before the pet is sent home.